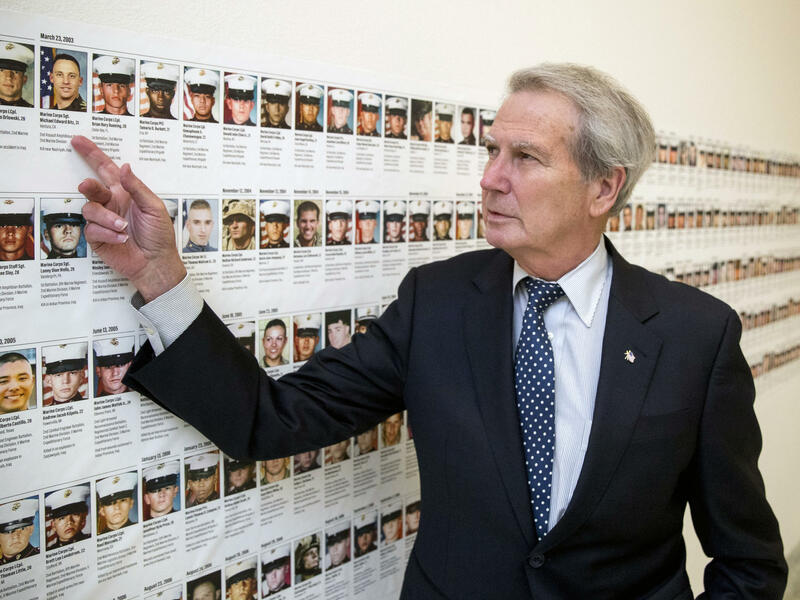 In this file photo, U.S. Rep. Walter Jones, R-N.C., stands in front of photos of fallen soldiers along a hallway leading to his office on Capitol Hill in Washington, D.C. Jones, a once-fervent supporter of the 2003 invasion of Iraq who later became an equally outspoken Republican critic of the war, died Sunday. Jones was originally a strong proponent of the Iraq War, but after attending the funeral of a Marine sergeant killed by a rocket-propelled grenade, Jones came to believe the human cost was too great. He spent the rest of his days writing letters to the families of almost every fallen soldier — an attempt not just to comfort the families but also to atone for his 2002 vote in favor of the invasion, which he deeply regretted. "I have signed over 12,000 letters to families and extended families who've lost loved ones in the Iraq and Afghanistan wars, and that was for me asking God to forgive me for my mistake," he told NPR in 2017. He spent the last several years as a lonely Republican voice urging Congress to bring American troops home. "I did not do what I should have done to read and find out whether Bush was telling us the truth about Saddam being responsible for 9/11 and having weapons of mass destruction," Jones told a reporter in 2015. "Because I did not do my job then, I helped kill 4,000 Americans, and I will go to my grave regretting that." "Congressman Jones will long be remembered for his honesty, faith and integrity," his office said in a statement on his death. "He was never afraid to take a principled stand. He was known for his independence, and widely admired across the political spectrum. Some may not have agreed with him, but all recognized that he did what he thought was right." He will also be remembered for being one of the congressmen who pushed to rename the congressional cafeteria's french fries "freedom fries" after France opposed the 2003 U.S. military action in Iraq. Before serving in the U.S. House of Representatives, Jones spent 10 years as a Democrat in the North Carolina state House. He first ran for Congress in 1992 as a Democrat, attempting to fill the seat of his father, Walter Jones Sr., who served in Congress for over 25 years, the Raleigh News & Observer reports. But failing to win the state's Democratic primary, he changed parties and in 1994 won a seat as part of the so-called "Republican revolution" that made Newt Gingrich speaker of the House then. "He was a man of remarkable integrity and stubbornness," Gingrich tells NPR. "A pretty good model for a citizen legislator."